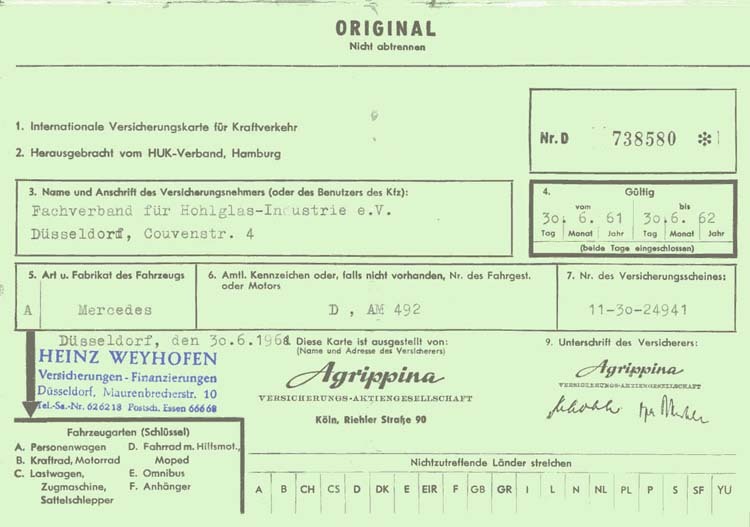 My 1957 190 was delivered on November 17, 1957 to Fachverband fur Hohlglas-Industrie e.v., which I believe was a glass factory in Dusseldorf, where it stayed for five years. The second owner imported it to San Francisco. 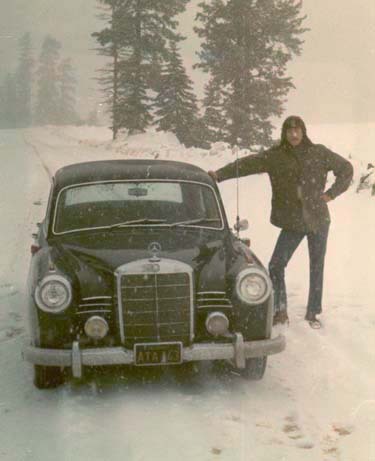 I bought it in January of 1969 from a Mercedes dealer in Long Beach, California and have had it ever since. When I bought the car, I asked about the former owner and they said he brought it over from Germany and that he was from San Francisco. 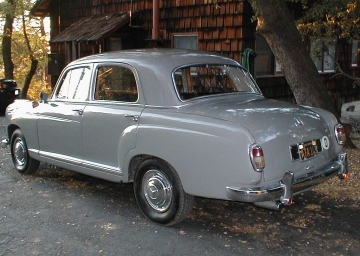 The California black license plate "ATA 143" at least bears out that it was registered in the San Francisco Bay area in 1963 (the "A"s' were all Bay area cars). This car has a couple of things I have not seen on other 190 sedans. Along with fog lamps, it has 219/220S style running lights on the front fenders as well as a chrome accent that runs from the front fender to mid front door. Also, it has the horn ring turn signals and headlight flashers and 1 ½ Volt night parking lights that I think were common to European versions. The fender mounted running lights were part of the car when I bought it in 1969. I replaced the lenses. The original ones were cracked and faded and were more yellowish than the current amber ones when they were newer. How did I come to buy it? While in Viet Nam I took my R&R to Kuala Lumpor and from the way my taxi driver drove his 180D, I knew someday a ponton was for me. So, about six months after getting out and back in college and needing more room, I sold my 1960 MGA and got the Mercedes. Unfortunately, that MGA with its wire wheels and all is now worth many times the value of the MB. Who knew? Besides one can only put up with Lucas, "the Prince of Darkness" for so long. That car would stop cold in a good fog. 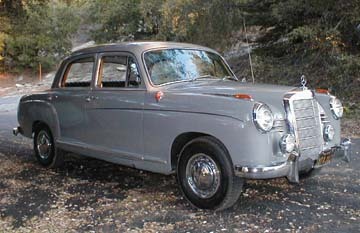 The photo of the rear of the car shows the original tail light lenses and what the running light lenses would have looked like. The engine was overhauled in 1971 and valves again in 1974. Originally black, it is now a medium grey with a black vinyl interior. 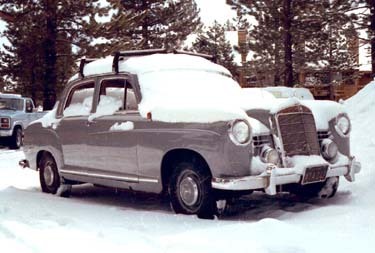 It has been stored now for over 20 years in Idyllwild, California where the altitude and dry air are friendly to it. It gets driven around every few months or so. Some time ago I bought and dismantled a 1959, so there are plenty of parts. 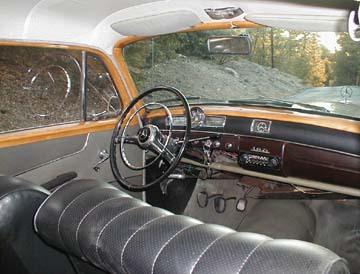 In around 1974, I installed the wood window trim from a friend's 220S that was going to be junked. 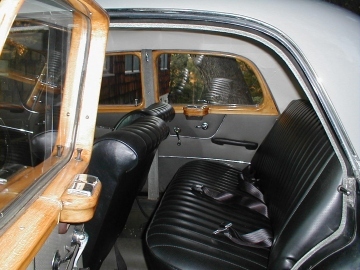 The wood for the rear doors had to be shortened. The seam is visible in the photo, but that is more from the harsh camera flash as normally it is not really all that noticeable. The interior was redone in 1985 without much intent for authenticity. Also notice the armrests are from a 1959. About a year ago I thought the motor was coming to an end however. After starting it up after a long winter's sleep, there was no power and limited RPMs. Then huge amounts of white smoke came out the exhaust along with an acrid smell. After about ten minutes of this, there was a sound like a small mortar and it shot hundreds of burnt acorns a good 50 feet out the back and into the hillside across from the garage and the engine returned to its normal self. Seems the chipmunks were using the exhaust system for storage! 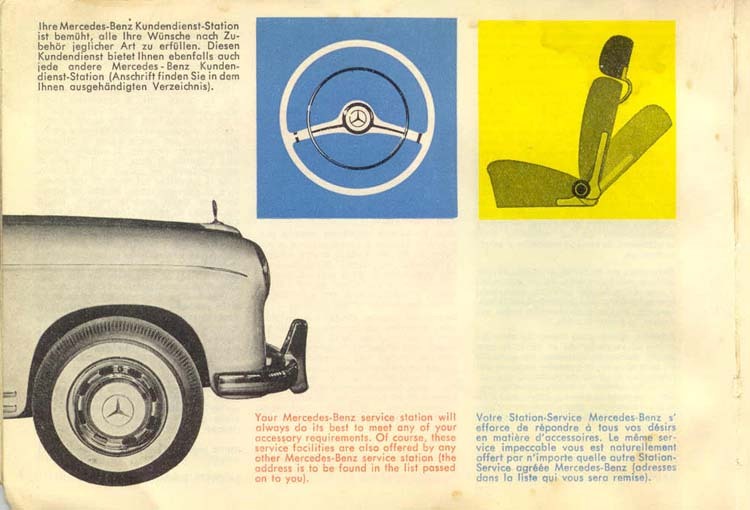 The German insurance expired 30 June 1962. A page from the service manual with the numbers. 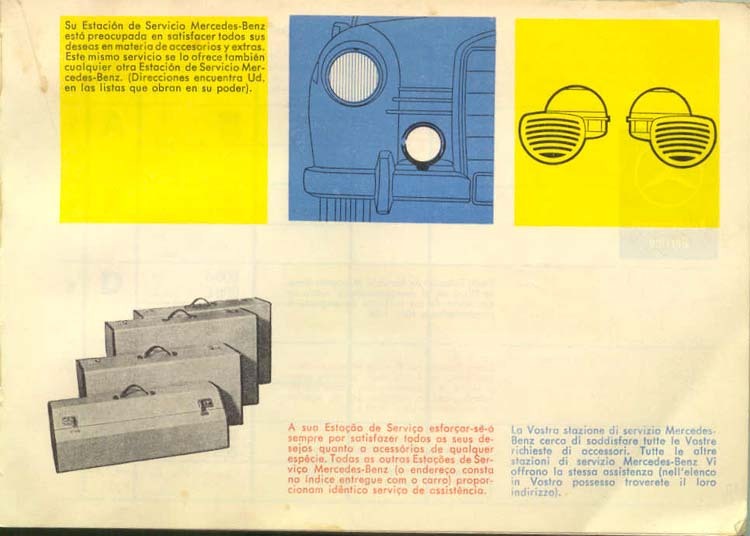 My service manual is original and shows a few of the accessories offered in 1957; reclining seats, fog lamps, dual horns, luggage, etc. No running lights though, but the manual is for all models. Note the fender on the car in the photo. Because of the bumper, it appears to be a 220S with the chrome strip, but where is the running light? 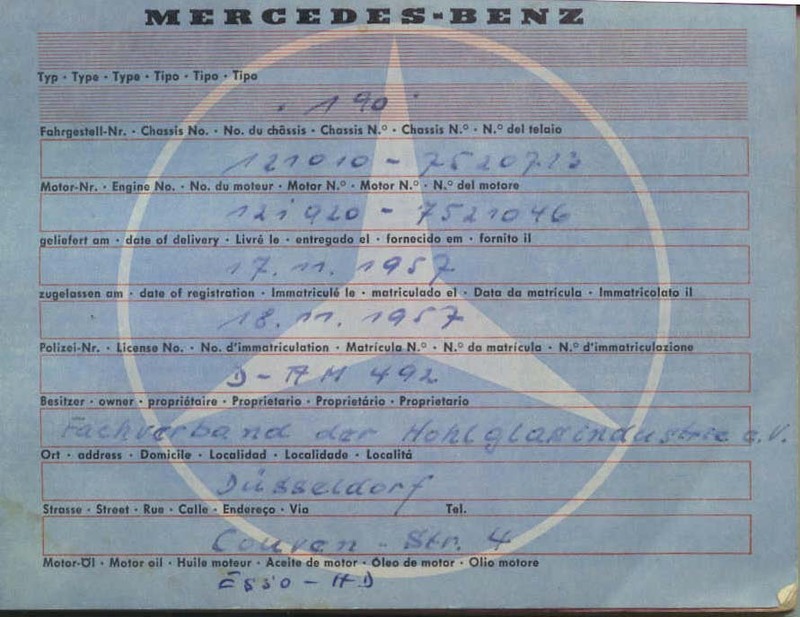 As the documentation I sent shows, it was a "company car", so possibly a whole fleet was made that way. I looked up the address and though the factory is long gone, it was on the waterfront and thus explains the need for the fog lamps and extra back up light. 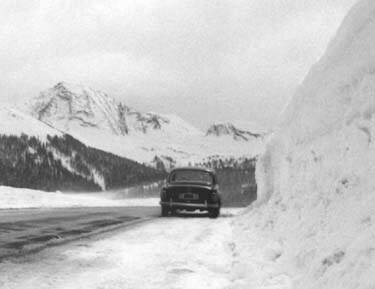 Durango, Colorado in the spring of 1973, when the car was still black. Yeah, that's me. I was singing at a place in Durango at the time, still an entertainer. Now that I think of it, Emmy Lou Harris, Rodney Crowell and others have ridden around in that car back in the 1970s when it was a daily driver. The top of the Molas Pass (elevation 11,000') in Colorado. Spring of 1973. As far as handling in the winter conditions, for 2 wheel drive and no posi-traction, it was about as good as you can get; about like a VW. It went just about anywhere, even moderate hills without chains. This photo is from where I lived in Mammoth Lakes, California around 1981. By then the heaters had rusted out and the cardboard gone bad, so it was pretty darn cold riding around in those conditions. The up side was that there was never a problem with the windows fogging up. I would like to fix the heater situation someday and I have an aftermarket Frig-King A/C unit for a ponton. Maybe there is a trade out there somewhere.